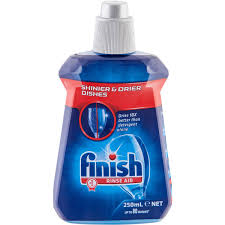 Finish Rinse Aid quickens the drying process and helps to remove water from your dishes. Food and detergent residues can stick to your dishes in the rinse cycle leaving spots on your dishes. Finish Rinse Aid works in the rinse-cycle to thoroughly clear away detergent and water residues from glassware.